CALVERT LSA is ONLINE NOW! The Maryland Tech Council (MTC) announces the opportunity for three (3) graduating high school seniors in the Greater Washington-Baltimore area to be awarded a one-time scholarship totaling $3,300. The scholarships will be presented at MTC’s 30th Anniversary Industry Awards Celebration on May 17, 2018. The scholarship is funded and presented by Alexandria Real Estate. 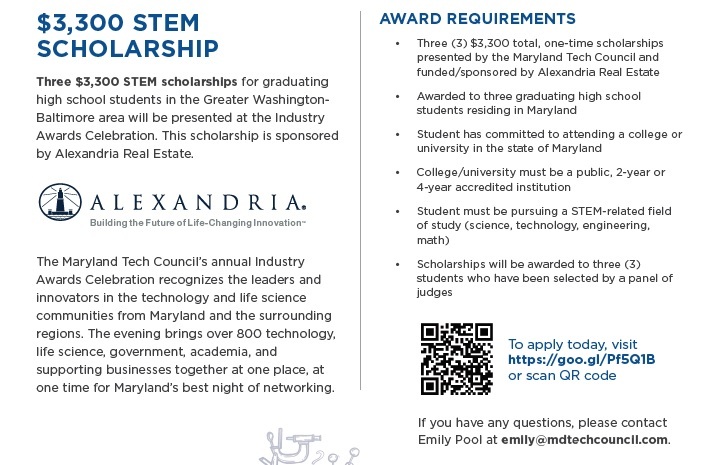 In order to be eligible for the scholarship, the student must reside in Maryland, have committed to attend a public college or university in the state of Maryland and must be pursuing a STEM-related field of study. , the form may be found at the following link: https://form.jotform.com/80384186764163. The mission of the MSSA Scholarship Foundation is to provide financial aid to undergraduate college students who show extraordinary promise of contributing to the marine environment the Chesapeake Bay, its tributaries, and the coastal waters of the mid-Atlantic seaboard. The goal is to grow a cadre of accomplished professionals who can make a positive impact on the marine ecology. For High School Seniors graduating in 2018: Any resident of Maryland, Virginia, Delaware, Pennsylvania, West Virginia, or Washington, D.C. is eligible to apply for a scholarship. Applicants must intend to be a full-time student during academic year 2018-2019 enrolled in any accredited institution of higher learning in the United States. 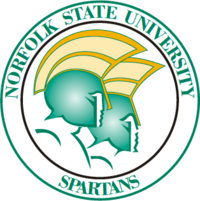 For college/university students currently enrolled in a full-time course of study in a relevant major: Applicants, including students now receiving financial aid from the MSSA Scholarship Foundation, may be at any grade level from college freshman to junior and intend to be a full-time student in the next academic year. The award may be used to study in any accredited institution of higher learning in the United States. The Board of Directors recognizes that a college education involves knowledge of a broad range of fields, including history and literature as well as science and mathematics. It also involves the acquisition of a range of skills such as critical thinking, written and oral communication, problem solving, teamwork, and integration and application of knowledge. Study in-depth in some specialized area is also a critical part of an effective education. While some major fields of study are directly related to efforts to improve the marine environment, such as marine biology or environmental studies, the relevance of other disciplines must be demonstrated by the student in his/her personal essay. The award is for the academic 2018-19 school year. The amount of the award varies according the Foundation’s fund balance and is set annually by the Board of Directors. In recent years, awards have been made ranging from $1,000 to $5,000. The Board has stated a preference for making larger awards to a small number of students so that the scholarships cover a larger portion of college costs rather than small awards to a large number of individuals. A recipient may apply for another scholarship in succeeding years, so long as they make acceptable progress toward their degree and maintain at least a 3.0 grade point average (GPA) based on a 4.0 scale. This scholarship is based on merit, not financial need, as the Board of Directors intend to support outstanding students who are expected to make a significant impact on the marine environment. Those individuals who are judged more meritorious may receive a larger award than others. Several criteria will be used in reviewing the applications. All Applicants must submit a complete 2018 MSSA Scholarship Foundation Application. All High School Seniors must submit an official transcript of academic work and a personal essay between 300-600 words that includes your educational goals, post-baccalaureate intentions, career ambitions, and an explanation about how your education will help you to enhance the environment of the Chesapeake Bay watershed and coastal waters of the mid-Atlantic. All college/university students must submit official transcripts from all colleges or universities attended and an essay between 300-600 words similar to that required of High School Seniors. The deadline for postmark is 5:00 p.m. Friday, April 13, 2018. The Board of Directors will review the applications, and decisions are expected to be made and announced to successful applicants on or before June 1, 2018. Recipients will receive a check made out jointly to themselves and the institution of higher learning in which they enroll to be applied toward school expenses. Scholarship recipients will receive a one-year membership in MSSA, which will entitle them to receive the quarterly Tidelines, electronic messages, and other communication with members. In addition, recipients will be encouraged to attend MSSA Chapter meetings at a location convenient to them and to make brief remarks about their educational and career plans and about how the scholarship is helping them to achieve their goals. The primary expectation for each recipient is that she/he acquire the best education possible. Also, each recipient will be required to make a brief report, approximately one page, on the highlights of their academic year. Details regarding the submission of this report will be provided to the winners of scholarships in 2018. 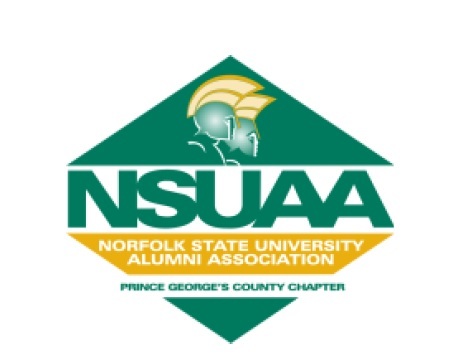 For questions regarding the application process, please contact Peter Abbott, President, MSSA Scholarship Foundation Inc. at 443 871 5342 or by email at abbottgru@aol.com. Founded in 1972, the National Naval Officers Association (NNOA) is comprised of officers from the Coast Guard, the Navy, and the Marine Corps – the nation’s Sea Services. NNOA provides professional development and mentoring in an effort to recruit, promote, and retain minority officers in the Sea Services. NNOA seeks to strengthen a diverse officer corps to enhance operational readiness in the Sea Services and has a long history of providing a positive image of the Sea Services in minority communities and educational institutions..
Each year, the Washington, DC Chapter of the NNOA (DCNNOA) awards scholarships starting at $1,000 to minority youth from the Washington, DC Metropolitan Area based on academic achievement, positive community involvement, commitment, and financial need. Scholarship recipients select their major and attend the college or university of their choice without any obligation to join or affiliate with the military; unless stipulated by the scholarship sponsor. Students must submit a complete application package in order to be considered for a scholarship. the Esperanza Education Fund. In 2018, the Esperanza Education Fund will again award scholarships of at least $5000 and up to $20,000 to immigrant students and students who have two immigrant parents in the District of Columbia, Maryland, and Virginia to attend public colleges and universities. Students are eligible for the scholarship regardless of ethnicity, national origin, or immigration status. For more information about the scholarship and to read more about our current scholars, please visit www.esperanzafund.org. The scholarship application is now available and can be accessed through http://www.esperanzafund.org/about-our-scholarship/. The application process is entirely electronic, and all applications are due on March 30. For award consideration, the attached application must be completed and mailed along with all supporting documents to the address below. All materials must be postmarked by Friday, April 6, 2018. Late applications will not be accepted. Kids Chance are actively accepting scholarship applications from students who have lost a parent to a workplace injury/accident, or if the parent was catastrophically injured and cannot return to work. Our website is www.kidschance-md.org. We do not have a deadline date for applications, though we would like to have forms submitted by July 1, 2018. Two Year or Tech School Scholarship!